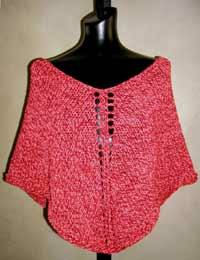 Knit up a new poncho quickly and easily with this beginner level poncho. It knits up quick on size 15 circular needles. No seaming! The easy-to-master increases are fully explained in the pattern. And all the rounds are written out to make the instructions a breese. A garter stitch border makes a nice finishing touch. Shown in a really soft merino wool/acrylic blend yarn. Can be worn as shown with a V-neckline, or as a wide shoulder-baring boatneck. 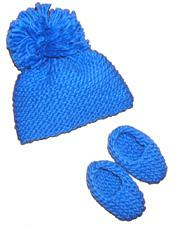 Uses size 15 circular needles (32" length).